You don’t want to miss this chocolate deal! This is the prefect gift to give anyone on your list, who doesn’t want chocolates?! 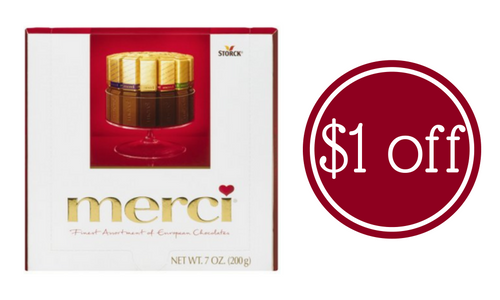 Print off a $1 off merci chocolate coupon and head to Target for the best deal in town. While you are printing the coupon, you can also make a custom sleeve for your gift on their site. Have a nice treat for yourself or grab it for a stocking stuffer.